PK-2030 Comes with #1 remote ID with RJ45 jack, HDMI A, HDMI C connectors. PK-2032 Comes with #1 remote ID with HDMI A connector. PK-2033 Comes with #1 remote ID with Display Port and HDMI connectors. PK-2036 Comes with #1 remote ID with DP, Mini DP and HDMI A connectors. PK-2037 Comes with #1 remote ID with RJ45 jack, USB 3.0 A/B, Micro USB A/B, and HDMI A connectors. PK-2038 Comes with #1 remote ID with HDMI A, C, and D type connectors. 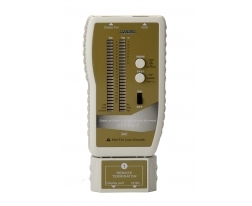 PK-2033 R2-8 smart remote identifier #2 - #8. NEXTest 7 is an advanced and unique tester in the market. It's designed to check and troubleshoot the pin connections of Display port & HDMI prior to installation on equipment. By using advanced technology to verify the integrity (20 pins + shield) of both display port and HDMI cables, especially for HDTV installation and DIY termination in the field, solving your cable testing need, unlink all of the other testers verify 9 circuits only. It checks for opens, shorts, miswires and intermittent faults in all conductors plus shield continuity, most tester only test for opens. It displays cable map results of both TX (near end) and RX (far end) on the main unit, either on testing before or after installation cables. User can easily read and determine the actual 21 pins configuration on main unit. It employs both auto and manual scanning of 21 wires. Tone Generator mode transmits two selectable tones on each pin for use with Net Probe (PR-06P) optional, enables one to quickly locate a cable. It's capable of testing up to 8 cables and locations at one time. 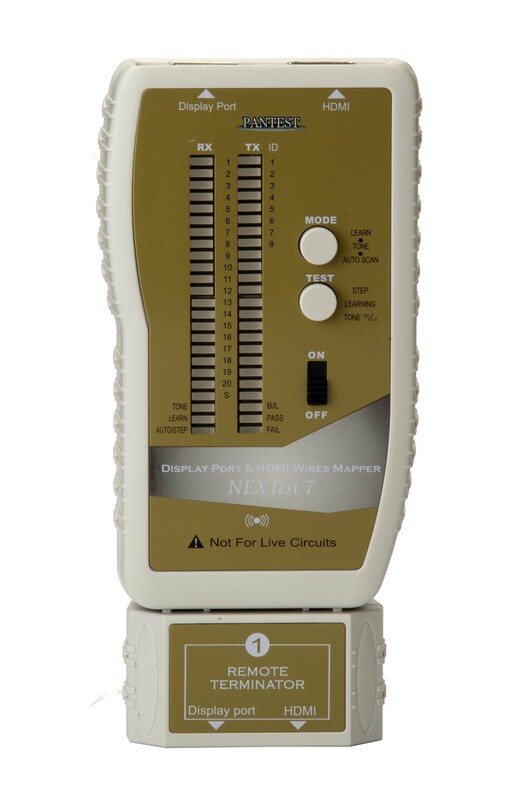 NEXTest 7 especially features a self-learning mode to memorize cable pin out for testing large quantity standard or custom cables for PASS/FAIL a snap, makes testing quick and more efficient. The NEXTest 7 can also test DVI cables or DVI to HDMI or Display port cables using an HDMI/ Display port male to DVI female adapters. PK-2030/2037 testing also include RJ45 data cable, USB 2.0/3.0 A/B and Micro USB A/B cables. NEXTest 7 allows CE installers, cable dealers and cable assembly houses to instantly verify the performance and test for the installation and maintenance of both Display port and HDMI cables, Including DP, Mini DP, HDMI A, C(mini), and D(micro) type cables. 1. Single end operation unlike most other tester, no running to far end to read the light. 2. Learn mode allows installers to have much faster and easier on 21 pins wire mapping. 3. Clearly determine the actual 21 pins wiring easily and efficiently. 4. Advanced wiremap pin by pin help you pin out intermittent faults. 5. Save time and accuracy by diagnosing connectivity faults. 6. Perform on-site cables easy and save installers repair time. 7. Generated 2 selectable tones for use with Net Probe for cable tracing. 8. Identifies and maps up to 8 cables and locations at one time. 9. Tests all types of Display port and HDMI cables. PK-2032: A type HDMI Female connectors. PK-2033: DP Female & HDMI A female connectors. PK-2036: DP, Mini DP & HDMI A connectors. PK-2037: RJ45 jack, HDMI A, USB 3.0 A/B, and Micro USB A/B connectors. PK-2038: HDMI A, C & D connectors. DP, Mini DP, HDMI A, C & D cables, RJ45 Data, USB & Micro USB. Opens, shorts, reversed, miswires as well as ID number. Auto/Step Scan, Learn and Quick test and Tone Generator.